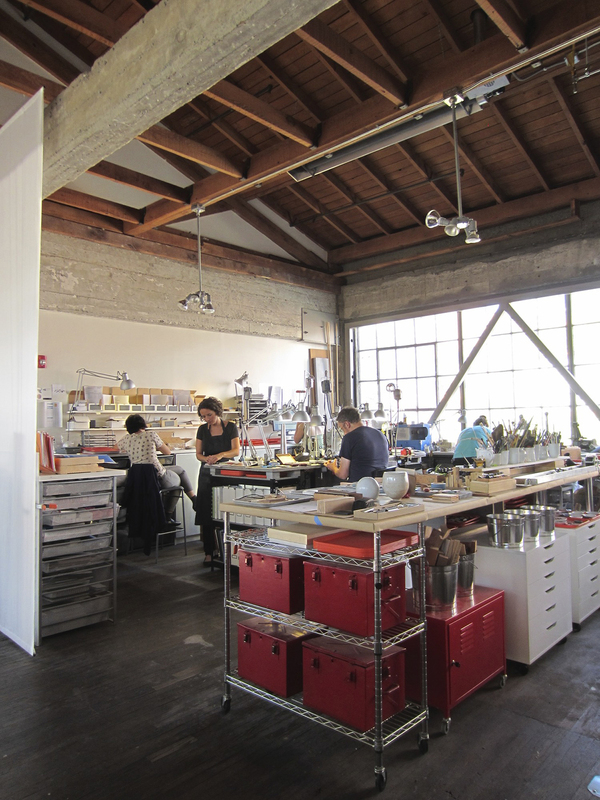 Heath Ceramics is hosting "Under One Roof," an exhibition showcasing the diverse array of makers who have studios at its San Francisco outpost. Bet you didn't know that the ceramics factory is also home to a collective of letterpress artists, jewelry designers, apparel, and more. "The designers represent the diversity of San Francisco, have great making chops, and a shared curiosity," says Tung Chiang, Heath's Clay Studio director and curator of the exhibition. "The Bay Area has been a magnet for makers for a long time and the people in the Heath Collective reflect that balance of maturity and freshness." The exhibition runs until November 2. Julia Turner creates enamel-coated metal jewelry that, like Heath's studio ceramics, features a textured surface. The Aesthetic Union creates posters, business and greeting cards, and other printed matter. Moving toward textiles, Olli offers delicately embroidered pillows and other softgoods that boast playful motifs. In addition to the aforementioned designers, catch work from artisan textiles and apparel studio Small Trade Company; textile artist Llane Alexis; handwoven apparel and textile maker Voices of Industry; and jewelry maker Liz Oppenheim. "It's a very diverse group, which we like," Chiang says. "What unifies the participants is a deep relationship with both design and material. Great craft is not complete without design." Under one Roof takes place from October 25 to November 2 at 2900 18th Street, San Francisco, California, 94110. For more info, visit heathceramics.com.